The First Baptist Church in Kennett Square was nearly filled on Aug. 31 for International Overdose Awareness Day. They came in groups of two or three or four, wearing T-shirts with photos of departed family members. There were hugs of recognition and welcome, and a steady drone of conversation as the pews filled at the First Baptist Church in Kennett Square. By the time the program started on the evening of Aug. 31, there were just under 200 people who had a loved one fighting drug addiction, or a loved one who had lost the battle. There were far too many people. To mark International Overdose Awareness Day, the grassroots addiction support group Kacie's Cause held a meeting and vigil at the church. Similar meetings were held in Delaware County, Oxford and Exton, and at well over 300 other places in the nation. It was a chance to connect, to share grief and support information, and to shine a light on an epidemic that has touched nearly everyone. Andy Rumford, whose daughter died of a drug overdose, started Kacie's Cause. Andy Rumford, whose daughter, Kacie, died of a heroin overdose four and a half years ago, opened the evening by reading a poem he reads daily for solace. Pastor Daniel Nicewonger, who opened the First Baptist Church for the meeting, spoke about endurance in the face of turmoil. Tovar asked Dinniman about starting needle exchange programs to insure that addicts at least are not spreading diseases by sharing needles. Currently, Tovar said, clean needles are considered drug paraphernalia and are illegal to distribute. Holdsworth has been in local law enforcement for about 20 years, he said, praising the DARE program that used to educate young students about the dangers of drug abuse. “But the program didn't continue through middle school and high school,” he said, so it gradually lost its effectiveness. There were questions from the audience about joint police/student after-school programs, mentoring programs, and whether addicts who are arrested for drug possession should be put in jail or steered first to rehab programs. Children and adults shared their grief at a vigil after the meeting. Rumford mentioned safe injection sites – places where addicts could use drugs in medically supervised surroundings – as being successful in Vancouver, where 600 to 900 people a day are monitored for signs of overdose. Similar sites are set up in England, he said, and are saving lives. Locally, there is no such site. A former addict, Adam Lush, spoke to the families about his own experiences. Now clean and sober for 13 years, Lush said he was the son of alcoholics who showed him by their actions that drinking was fun. After drinking two beers the first time, Lush said, he woke up the next day feeling horrible. “Whereas a normal person would not do that again, the definition of being an addict is using a substance over and over again despite negative results,” he said. At 19, as a student at West Chester University, Lush found himself paralyzed with fear about going into the hallway for a drink of water. “That's when I realized that something was really wrong.” He broke down, called his parents and was taken to a recovery support program. Pastor Daniel Nicewonger says a prayer at the vigil. Tovar reminded caregivers that “you have to work on yourself first. That's hard to do, especially for moms, who want to fix everything. But addicts are good at lying,” he said. “They're very good at that. That's the disease, that's not your kid. It was hard for me to let go, but you've got to trust yourself. At the back of the church, a young man stood up. 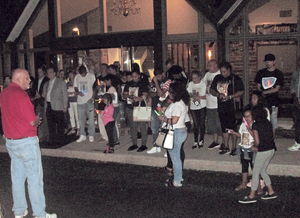 At the end of the program, the crowd of family members filed outside to the parking lot, where glow sticks and glow necklaces were distributed. Nicewonger said a final prayer in the center of the circle, and several family members mentioned aloud the names of those they had lost. While young children waved the glow sticks and darted happily back and forth, their parents, siblings and grandparents stood silently, holding each other's hands and sharing their grief. For information about Kacie's Cause, visit www.kaciescause.com.